Up in the north the American First and Ninth Armies reached the Rhine. The Allies, capitalizing on a fateful German blunder, made the first crossing March 7 over the Rhinespanning Ludendorff at Remagen. Even as the bridgehead was secured, Field Marshal Albert Kesselring, replacing von Rundstedt as top enemy commander in the west, watched for follow-up crossings in other army sectors. In early March the American Third Army, after reaching the Rhine turned south, enclosing a large body of Germans in the Saar-Palatinate. On March 15 a general Seventh Army offensive opened in conjunction with the Third Army attacks to destroy all German forces west of the Rhine in the Saar-Palatinate. The 36th Division in the Haguenau sector, part of the VI Corps, was the right flank division of the Army. On its right, between it and the Rhine was the 3rd French Algerian Division, and attacking abreast on the left was the 103rd "Cactus" Division. Two tasks were assigned the 36th: to break the enemys Moder River defense line, allowing the 14th Armored Division to roll through; then to breach the Siegfried Line, seize Bergzabern and flank that portion of the Siegfried facing the French forces on the right. The Germans had been organizing the Moder River Line since early February. Opposite the Division this position included the northern section of Haguenau and the broad Haguenau Forest, with open ground only on the left. Before a real breach could be made so that the 14th Armored could operate, three riversthe Moder, the Zintel and the Sauerhad to be crossed and bridged. 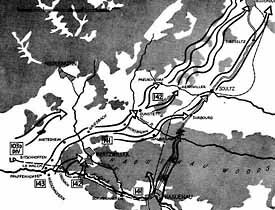 In addition, the highway from Haguenau to Soultz had to be cleared as it was to become the Corps main supply route. However, for miles this road cut through the deep Haguenau Forest, and air photographs had disclosed many long stretches of prepared abatis on the road. As a push aimed straight through the Forest would have been too slow, the Divisions main effort was placed on the left in the open ground to the west of the Forest. Lt. Col. Charles Denholms 143rd Infantry was chosen for this task. He assembled his regiment, three companies of tanks and tank destroyers, and an engineer bridge train near the village of Pfaffenhoffen where a small bridgehead over the Moder already existed. Through leveled Bitschoffen (below) K Company, 143rd Infantry, opened a supply road (above) vital to the Infantry units of the entire Sixth Corps. The 3rd Battalion led off at 0100, morning of the 15th. To obtain surprise, no artillery preparation was permitted. Lt. ODean Coxs Company K, attacking over terrain offering no concealment or cover and over ground heavily sown with antipersonnel shu mines, captured Bitschoffen and opened the Bitschoffen road early in the morning. Repulsed three times, the company had reformed and captured the town although one third of its men had been killed or wounded. For this action Company K received the Presidential Unit Citation. The Division Commander in presenting it later said, "I know of no action in the war by any unit which so deserved a citation." While K Company was engaged in Bitschoffen, the remainder of the 3rd Battalion had attacked cross-countrv to seize Mietesheim, and the 2nd Battalion was clearing the western edge of the Haguenau Forest. As soon as the 3rd Battalion had won the Bitschoffen road the 1st Battalion was committed to keep the breach open. It forced the Zintel River by wading the stream near an old mill. All night troops over the river fought off counter-attacks, one launched by the reserve battalion of the 36th German Division, led by tanks. Morning found the bridgehead holding firm. Before noon a bridge had been built and Griesbach entered. Without stopping the Battalion raced for Gunstett on the Sauer River, in an effort to capture the bridge intact. But as the leading elements came down the hill before the river the bridge was blown and another fight for a bridgehead became necessary. One more day of hard struggle passed before Gunstett was cleared. While the 1st Battalion fought from house-to-house (its spearheading drive through Mietesheirn and Gunstett also earned a Presidential Unit Citation), the 2nd Battalion had cleared the western edges of the Haguenau Forest and the 3rd Battalion moved up to cross the Sauer east of Gunstett. By dark the town had been taken and engineers were working on a bridge. With the first of the Divisions missions accomplished, the 14th Armored Division was alerted for its advance. 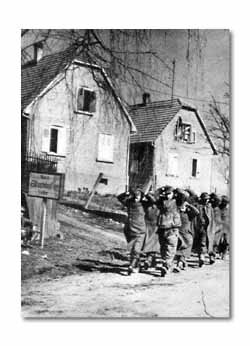 66 Prisoners were taken by K Company at Bitschoffen. While the 143rd was forcing three rivers, the 142nd on its right captured Mertzwiller and opened a second road. Led by Lt. Colonel Everett S. Simpsons 3rd Battalion and Lt. Col. Marvin J. Coyles 2nd Battalion, the Regiment jumped off at 0100 in the morning. The 2nd Battalion partially across the Moder was hit by intense artillery preparations and forced to withdraw. The 3rd Battalion, however, regardless of the mines, pressed on through the forest, and by daylight had gained a foothold in Mertzwiller. While the 2nd Battalion was being reorganized, the 1st Battalion was committed to fight through to join with the 3rd. Though the Germans fought stubbornly to hold Mertzwiller, by the 16th it was in our hands and a bridge spanning the river within the town started. The 142nd was then reassembled and prepared to move through the 143rd as soon as the latter had captured Gunstett. On the Divisions extreme right the 141st had the task of clearing all of Haguenau and then opening the Haguenau-Soultz road. On March 13 some preliminary stabs were made across the Moder to enlarge the Haguenau bridgehead and to put in a bridge. 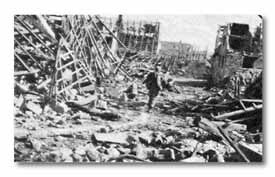 At 0300 on the 15th the 1st Battalion moved out of the east end of Haguenau while the 2nd cleared the remainder of the town. The 3rd Battalion was held in reserve covering the left flank while the 36th Reconnaissance Troop kept contact with the French on the right. Though progress was slow, all of Haguenau was cleared on the 15th and the defenses in the edge of the Forest breached. 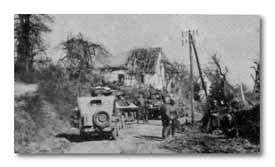 Next, the 3rd Battalion was committed on the 16th to clear the roadmainly an engineering job, but a nasty one because of the mined abatis. Early on the morning of the 17th the 1st Battalion was loaded on trucks and left Haguenau, moving through Mertzwiller to make an end run around the Forest and attack the last block in the woods from the flank and rear. That night the Sauer River was crossed and Surbourg taken, opening the main road to Soultz. The bridge at Gunstett was finished at midnight of the 17th. Immediately the 142nd, mounted on tanks, tank destroyers and artillery trucks, started across and headed due north for Wissembourg. At daylight the leading Combat Command of the 14th Armored followed across the one bridge and turned east toward the Rhine. As soon as they had cleared, the 141st moved into Soultz and started reconnaissance for the Lauter River, the last obstacle before the Siegfried Line. With opposition slight, the columns of the two regiments moved fast. 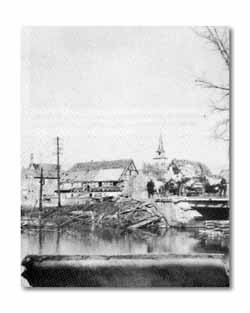 Early the next morning the 1st Battalion, 142nd, entered Wissembourg, throwing rocks into the Lauter River there to make their own crossing. An hour before, the 2nd Battalion, 141st, had forced a crossing several miles to the east. Thus on March 19 the 36th had crossed the last barrier to Germany. By early afternoon both battalions had entered Germany and were face to face with the Siegfried Line. 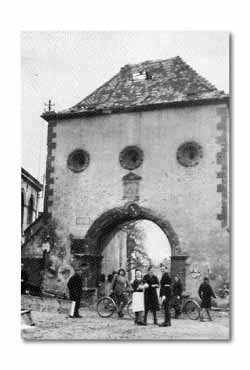 Civilians come out within Haguenau, after 141st had cleared it. The French return to Mertzwiller, 142nd objective. Pfc. Silvestre S. Herrera, 142nd CMH holder, lost both feet from German laid mines in the Haguenau Forest engagement. As his company sought cover from enemy fire, Herrera dashed toward a German strongpoint and pinned down the enemy crew with grenades and an M-1.